Want to know how to make possibly the best duck fat potatoes in the world? Check out this great recipe by Masterchef NZ runners up Nikki and Jordan Shearer. Delicious, crispy, and a lil’ over-indulgent… damn right, and totally worth it! If you’re anything like our family, you will be fighting over them so make sure you make plenty to accompany your dinner. Duck fat is incredibly tasty and just seems to make roast potatoes extra amazing. Leftover duck fat can also be stored in the freezer for quite a long time. Make sure you use fluffy textured potatoes (our favourite is Agria) and stay away from the waxy types. In a large pot of salted water, bring the potatoes to the boil. Parboil for approximately 12 minutes. Remove from heat, drain and allow the potatoes to dry out (at least half an hour). 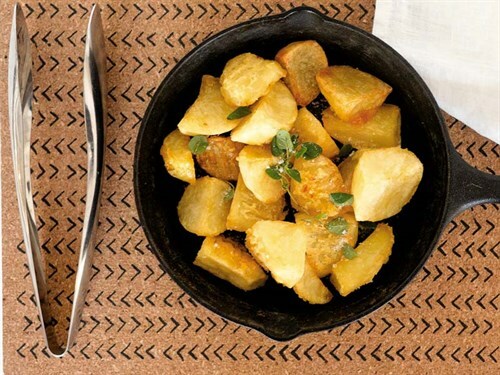 Arrange potatoes on a large baking dish and dot teaspoons of duck fat on each one. Place in oven for five minutes, until the duck fat melts, then brush the duck fat all over each potato. Season generously with flaky sea salt and return to the oven. Cook for approximately 40-60 minutes, until golden and crispy, turning occasionally. Check out this easy Moroccan lamb stew recipe by Masterchef NZ runners-up Nikki and Jordan Shearer.